SheerID is an eligibility verification service for retailers, marketers, and promotions officials, providing them with a platform to secure their promotions and exclusive offers by filtering their customers through an eligibility verification process. With SheerID, companies are ensured that only eligible customers may apply for their offers and promotions using a custom verification solution created specifically based on their requirements. 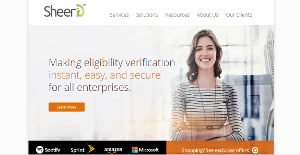 Using powerful verification technologies, SheerID is able to immediately verify and qualify eligible customers out of the usual offer groups, including students, teachers, military personnel, and more. Simply put, whenever you have exclusive promotions and events, only those customers who satisfy your eligibility requirements are able to enjoy your offers. SheerID maximizes the revenue potential of your exclusive offers and promos by ensuring that they remain exclusive to eligible customers. The software is designed to instantly verify any customer segments, thus resulting in highly increased conversion rates of your shopping cart as well as significantly enhanced and faster return of investment (ROI). With SheerID your customers are instantly verified within your shopping experience. The platform also boost your marketing reach, enabling you to discover and explore new customer segments via well-executed targeted offers. SheerID makes it easy for you to develop loyalty among your repeat customers through relevant messaging to affinity groups. Perhaps the most obvious advantage SheerID brings to the table is that it helps you protect your offers from concerted attempts at discount fraud. This capability ensures that only customers who satisfy your criteria are the ones who enjoy your offers and no one else. You can create and market your offers and exclusive promos though various channels, such as in-store, online, on mobile, or through your call center. Omnichannel promotions give your offers a wider reach and the huge possibility of attracting more eligible customers. You can configure your promos to be instantly redeemable through online and mobile verification, removing verification responsibility from your in-store and call center employees. Since each enterprise has particular business requirements, it is sensible for them to abstain from looking for a one-size-fits-all faultless software system. Needless to say, it would be useless to try to find such a platform even among market-leading software applications. The smart thing to do would be to list the various important aspects that require consideration such as key features, finances, skill levels of staff members, company size etc. Then, you should do your homework thoroughly. Read some SheerID reviews and check out each of the other apps in your shortlist in detail. Such in-depth research can make sure you reject ill-fitting platforms and choose the solution that offers all the elements you need for business success. How Much Does SheerID Cost? SheerID’s enterprise pricing information is available only upon request. Contact the company for more details, and ask for your quote. We realize that when you make a decision to buy Sales Software it’s important not only to see how experts evaluate it in their reviews, but also to find out if the real people and companies that buy it are actually satisfied with the product. That’s why we’ve created our behavior-based Customer Satisfaction Algorithm™ that gathers customer reviews, comments and SheerID reviews across a wide range of social media sites. The data is then presented in an easy to digest form showing how many people had positive and negative experience with SheerID. With that information at hand you should be equipped to make an informed buying decision that you won’t regret. What are SheerID pricing details? What integrations are available for SheerID? If you need more information about SheerID or you simply have a question let us know what you need and we’ll forward your request directly to the vendor.